DAZ Studio is a feature rich 3D figure modeling, posing, and animation tool that enables users of any skill level to easily create stunning digital imagery. 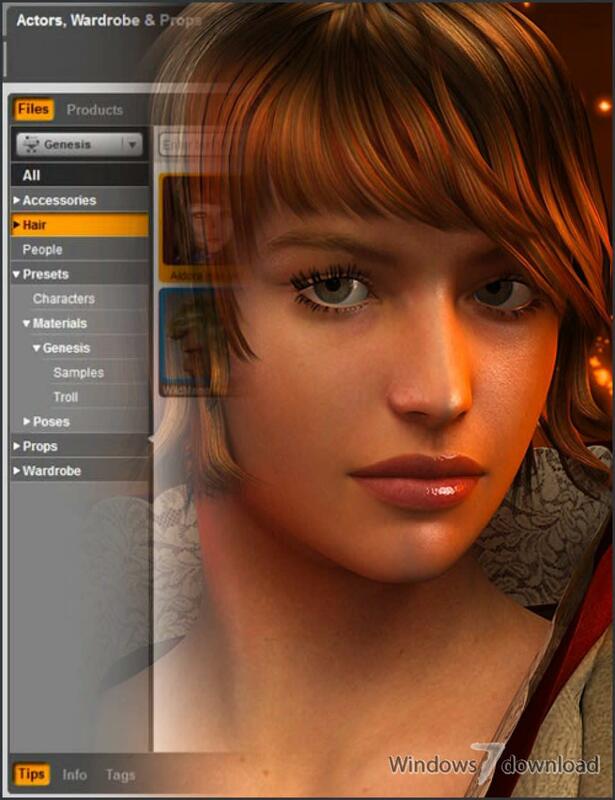 Whether you're a 3D newbie or an avid 3D artist, you'll find DAZ Studio is the perfect tool for designing unique digital art and animation with virtual people, animals, props, vehicles, backgrounds and more. DAZ Studio 4 Genesis™ Figure Platform wins the 3D World CG Technology Award. 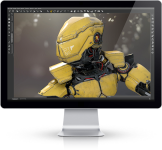 The Genesis Figure was voted Software Innovation of the Year for "breaking new ground and providing a clear benefit for artists in the creation or implementation of CG assets." Design amazing digital art with this popular 3D figure customization, posting, and animation tool, free for a limited time. Why pay hundreds of dollars to get started designing stunning 3D images and animations when you can get started today for free with DAZ Studio? When we say "3D", we don't mean special glasses or pictures that you have to look at cross-eyed to see the "hidden message". What we “do” mean is the ability to take people, buildings and models and move them around in a virtual environment as easily as if you were holding them in your hands. The DAZ Studio software lets you choose from thousands of 3D people, creatures, buildings and props to place into your scene or “photo shoot”. Then dress them, pose them, and give them expressions. Once the stage is set, adjust lighting and camera angles and start snapping your incredible and professional looking images. Best of all! Ownership of these images belongs to you. Use them as book covers, posters, or banners. Whatever you want. They're all yours to do with and sell as you like. You can now be the artist producing jaw-dropping scenes. Ready for the next level? DAZ Studio lets you bring your scenes to life. Use aniblocks, and add on plugins like Animate2 to leverage pre-built action sequences and movements, or design your own animations from scratch. Simply move and pose your figures in the scene, record those actions, and play them back. With this free software you'll not only be creating amazing visuals, but building full computer generated movies. DAZ also provides free video tutorials to guide you through things like laying out a scene, camera angles and placement, lighting tricks and more. Learn all of the factors that make a good photo or movie great. We'll walk you through them all as you direct your own creations and bring them to life in DAZ Studio. DAZ Studio 4.6 includes the full-featured DAZ Studio 3D application and numerous add-ons such as the Content Creator Toolkit for creating your own 3D content, 3D Bridge for Adobe® Photoshop®, The Texture Atlas, the GoZ Bridge For DAZ Studio 4 to ZBrush®, the Autodesk® FBX Exporter, and more. Download YOUR copy NOW and embark on your own creative journey! 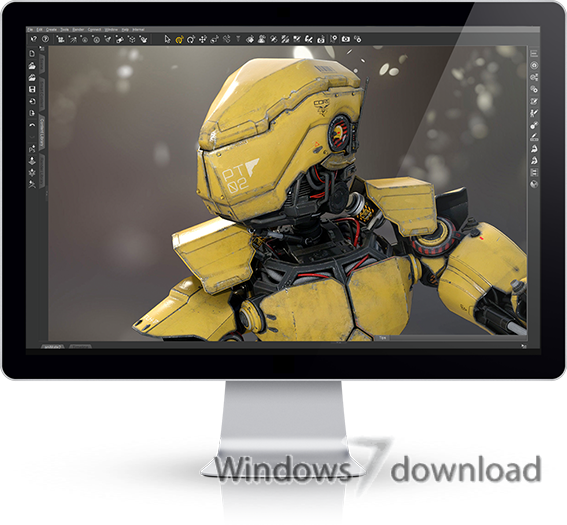 All DAZ Studio reviews, submitted ratings and written comments become the sole property of Windows 7 download. You acknowledge that you, not windows7download, are responsible for the contents of your submission. However, windows7download reserves the right to remove or refuse to post any submission for any reason. 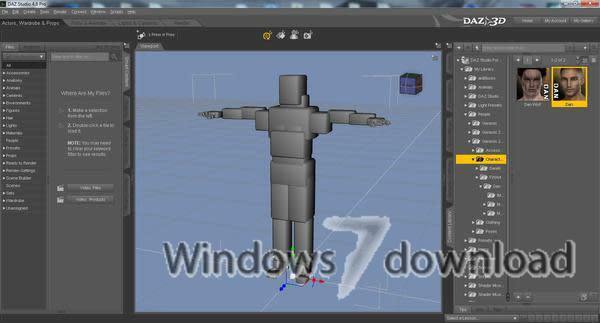 Windows 7 Download periodically updates pricing and software information of DAZ Studio full version from the publisher, but some information may be out-of-date. You should confirm all information. Using warez version, crack, warez passwords, patches, serial numbers, registration codes, key generator, pirate key, keymaker or keygen for DAZ Studio license key is illegal and prevent future development of DAZ Studio. Download links are directly from our mirrors or publisher's website, DAZ Studio torrent or shared files from free file sharing and free upload services, including Rapidshare, MegaUpload, YouSendIt, SendSpace, DepositFiles, DivShare, HellShare, HotFile, FileServe or MediaFire, are not used.